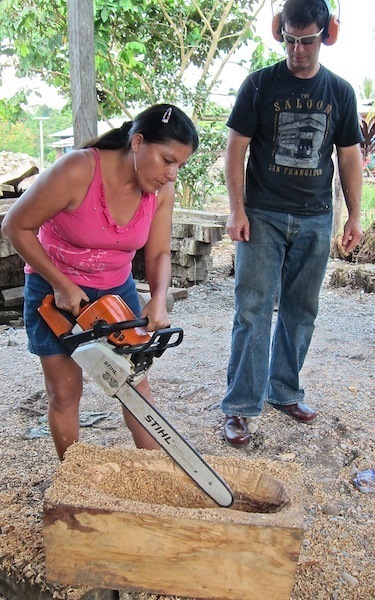 GreenWood is dedicated to appropriate technology, so skeptical readers might wonder about the “appropriate” introduction of chainsaws in the Amazon, where they are more often linked to vast environmental depredation than to art. 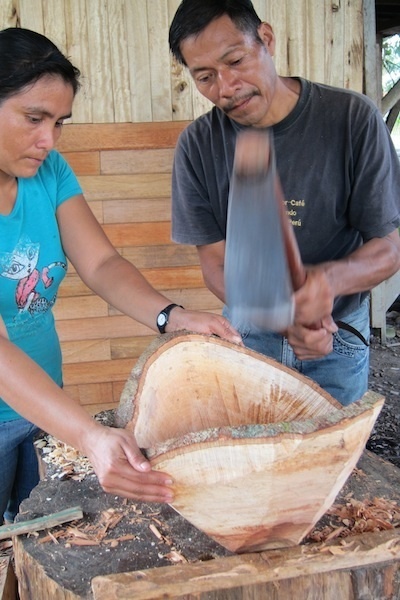 In fact, GreenWood’s local artisans are expert adze men and women, who struggle daily—along with our local non-profit counterpart organization PaTS—to meet the price points required to sell their hand-crafted carvings in a competitive world market. One of the key conclusions of the GreenWood instructors who led our January workshop in the Valley was the urgent need to expand and refine the use of the chainsaw to remove bulk stock in preparation for carving. Brad’s one-week workshop in the Valley did that, and much more. In a series of hands-on demos in three separate sites, he showed a dozen Yanesha artisans how bowl blanks could be prepped efficiently and safely with the chainsaw to greatly speed their completion with the adze. Yanesha artisans can still achieve their characteristic hand-tooled surface treatment, but in a fraction of the time it would have taken without the saw. More importantly, by taking his saw directly to abandoned harvest sites in the forest, he showed how a stump or a crotch or a half-rotted log can be “opened” up with a chainsaw to reveal a uniquely sculpted form that gives three-dimensional meaning to that amorphous territory between craft and art. In so doing, he also opened the eyes and imagination of our artisans to a world of creative potential they had not previously considered. New sculptural designs are sure to emerge from this dynamic collaboration. The story of Brad’s hunt for Hawaiian koa and African pink ivory was documented in two PBS “Tree Safari” programs. 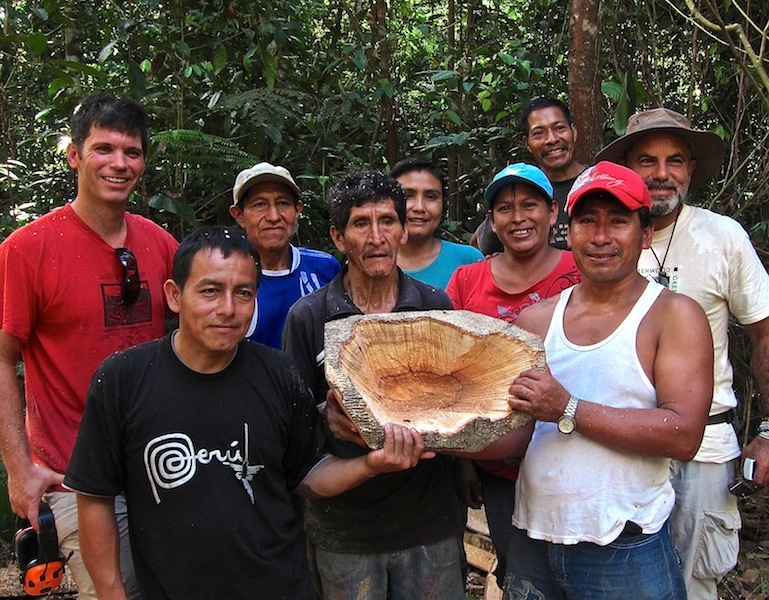 GreenWood is working with Brad to develop an Amazonian Tree Safari and, perhaps, a Mosquito Coast Tree Safari that would feature our mahogany guitar-part production in Honduras. Visit our Peruvian partners at: www.patsperu.com. See more of Brad’s work at: www.bradsells.com.